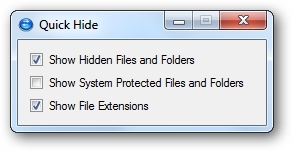 Quick Hide is a free portable tool that allows you to show hidden files & folders, protected files & folders and file extensions with one click. Just run the tool and select items that you want to show. It will apply the changes automatically.